After a long hiatus, I finally get around to purchasing another bag of coffee from that little shop of coffee delights, Ristretto on Howard Street, Perth. Or is it now called the Howard Street Cafe? Who knows and who cares. The most important thing is that it's there and it's pumping out great coffee. Imagine my very pleasant surprise when I find out that the coffee beans for sale won first place in the 2011 Cup of Excellence in Brazil! 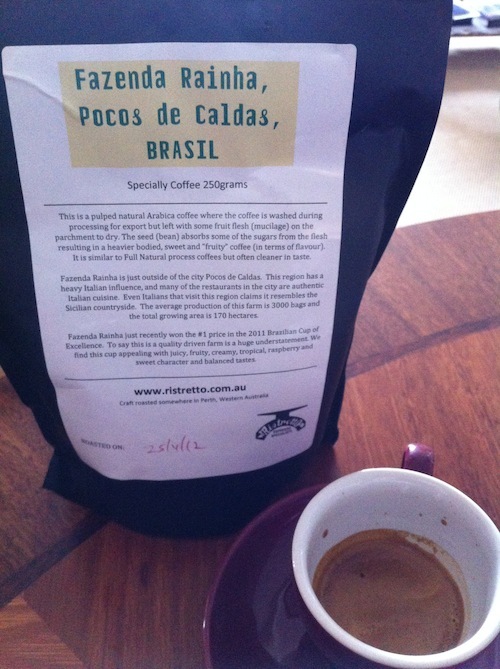 These beans are from the Fazenda Rainha farm just outside the Brazilian city of Pocos de Caldas, which has a heavy Italian influence. It has a delicate jaffa-like aroma when you open the bag, stick your nose in and breathe deeply. Now that's special! Here is the bag of beans with a doppio which Miss Silvia just made for me. As you can see, being freshly roasted only a week ago, the coffee is thick, fresh and bubbly, and came out in a slow drip of sweet, thick nectar through the portafilter. And here is a single espresso I made straight after - it's so good I had to try another one! The flavour is robust yet slightly sweet with a crisp lemon-green apple finish and the texture is smooth and creamy. It's even got some hints of grassy herbaceousness. There's also a bit of burnt caramel aroma in the cup after I finish it the doppio, but maybe that's because I may have over-extracted it (hey I'm no barista!). Even 10 minutes after drinking the coffee, as I'm typing this post, I am still enjoying the after-tastes, which include a hint of something elusive yet pleasant, which I'm struggling to put my finger on - the best I can think of is rose petal syrup. Believe it!